Drones Will Be Everywhere Watching, Listening, and...Planting Millions of Trees? Drones Will Be Everywhere Watching, Listening, and…Planting Millions of Trees? More and more people are getting to know drones, and not just the military kind. Drones were one of the hottest gifts over the holidays because they’re not only getting easier to fly (though not yet a no-brainer), they’re also pretty affordable. In fact, a toy drone recently crash landed on the White House lawn, prompting President Obama to call for more regulations (something the FAA is already working on). While these aircraft show the growing accessibility of drones, they belie their true potential. What is a drone? In the most general sense, it’s a flying robot with simple artificial intelligence onboard. Most toy drones have multiple rotors, are battery-powered, and carry a camera (or nothing at all). But drones can come in all shapes and sizes, from a machine that sits on your palm to one nearly the size of a full aircraft. Some look like multi-rotor helicopters while others are more like airplanes. They can be powered by batteries, engines, even solar panels. Crucially, advanced drones are able to autonomously fly pre-programmed flight paths, and limited only by weight, their payload can be pretty much anything you like. 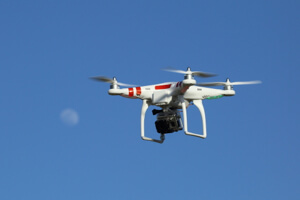 Recently, for example, ten media giants, including the New York Times, Associated Press, and NBC, said they would test drones for news gathering. Drones may bring big savings for news organizations who rent helicopters for $1,500 an hour or own and operate them for hundreds of thousands of dollars a year. And they can go where reporters would rather not. Amazon and Google, meanwhile, aim to use drones to deliver packages. And Matternet, an early champion of drone delivery, thinks they’ll prove useful everywhere from the skies over gridlocked megacities to developing countries with unreliable and seasonably inaccessible road infrastructure. 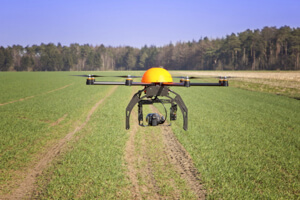 Farmers are using drones to provide detailed, low-altitude images of crops. Pending FAA approval of commercial drones in the US—which has been slow in coming—practical drones are likely to take off elsewhere first. Matternet is running its trials abroad, and DHL has been testing drone delivery in remote areas of Germany. Meanwhile, a million-dollar United Arab Emirates (UAE) competition, Drones For Good, recently attracted 800 entries from all over the world with a single aim—to find practical, positive uses for drones. The competition’s semifinalists are an interesting bunch. One group proposes equipping drones with a small refrigerator to more quickly ferry organs for transplant from donor to beneficiary. Another would use drones to discover and remove landmines by mapping minefields from the air. And then there’s BioCarbon Engineering. The team wants to use drones to map severely deforested areas—then send them along a programmed flight path using an onboard seed cannon to fire nutrient-rich seed pods into the soil. Their goal? Autonomously plant a billion trees a year by drone. But even as drones are maturing, they still aren’t perfect. Hurdles include inclement weather, payload capacity, power generation, and noise. And, of course, some regulatory agencies have yet to fully embrace the tech. What obstacles present the biggest challenge to more ubiquitous use of drone technology; what are the most promising applications—and what uses (good or bad) has no one thought of yet?